Gudrun Limbrick of this Former Children's Homes website was invited this September to give a presentation in Glasgow about the work of this website. 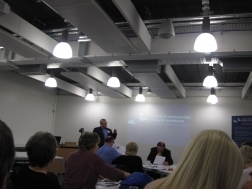 The event, held at the University of Strathclyde was entitled 'Reclaiming Lost Childhoods' and Gudrun was joined by a speaker from the Australian children's homes web resource Find and Connect, a number of Scottish initiatives and a number of care leavers. This was an excellent opportunity to share the learning from this website which has grown enormously over the last couple of years and a great chance to talk with care leavers and organisations in Scotland to talk about sharing information on former children's homes in Scotland. The link below wll take you through to a blog of memories about Martha Frew Children's Home, Dunfermline. Aberlour Orphanage, Moray (around 12 miles south of Elgin) took in children from 1875 to 1967, although the charity bearing its name still operates today. William Quarrier, in the 1870s, established a village of homes in Bridge of Weir, Renfrewshire (15 miles south of Glasgow). This self-contained community included 40 children's cottages, a church, a school, a fire station, workshops, and working farms. The Homes continued until late into the twentieth century. The work to support children continues under the name 'Quarriers'. For information on accessing records and the history of the homes, please visit the Quarriers website. 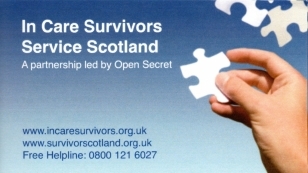 In Care Survivors Service Scotland (ICSSS) provides a variety of services to anyone over 16 years old who experienced any form of abuse while in a formal care setting as a child. A colection of copies of Poor Law Magazines has been digitised and is now available in searchable pdf format. Makes for a very interesting read.